Slenderman's Shadow: Sanatorium is a horror game set in an abandoned sanatorium where you are required to collect 8 pages clung on the wall while fleeing from the pursuit of horror creature called Slender. This game was made by Marc Steene and Wray Burgess. It is based of the original game 'Slender' by Mark J. Hadley (AgentParsec). 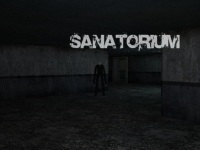 Sanatorium is the first map in the Slenderman's Shadow series. Your main mission is to take eight white pages that are spread in rooms in the sanatorium. Once you have collected all 8 pages, go back to your first place and the game ends. Feel the scary atmosphere during the gameplay. It is recommended to use headset/earphone since sound effects really satisfy the horror-feel. The more pages you collect the more likely you meet the Slender. Get scary adventure by collecting 8 teddy bears inside an abandoned school. Collect 20 money bags while running to avoid the ghost. The sixth map of the spooky-adventure game based on the Slenderman myth.